1 A None No Power Seat 1 A is a Business Class Bulkhead seat whose close proximity to the galleys may be bothersome. 1 D None No Power Seat 1 D is a Business Class Bulkhead seat whose close proximity to the galleys may be bothersome. 1 F None No Power Seat 1 F is a Business Class Bulkhead seat whose close Proximity to the galley and lavatory may be bothersome. 1 K None No Power Seat 1 K is a Business Class Bulkhead seat whose close Proximity to the galley and lavatory may be bothersome. 14 A None No Power Seat 14 A is an Economy Class Bulkhead seat that Brussels Airlines designates as "Economy Privilege". The close proximity to the galleys may be bothersome. The tray table is in the armrest, making the armrest immovable and slightly reducing the seat width. There is no floor storage for this seat during takeoff and landing. 14 C None No Power Seat 14 C is an Economy Class Bulkhead seat that Brussels Airlines designates as "Economy Privilege". The close proximity to the galleys may be bothersome. The tray table is in the armrest, making the armrest immovable and slightly reducing the seat width. There is no floor storage for this seat during takeoff and landing. 14 D None No Power Seat 14 D is an Economy Class Bulkhead seat that Brussels Airlines designates as "Economy Privilege". The close proximity to the galleys may be bothersome. The tray table is in the armrest, making the armrest immovable and slightly reducing the seat width. There is no floor storage for this seat during takeoff and landing. 14 F None No Power Seat 14 F is an Economy Class Bulkhead seat that Brussels Airlines designates as "Economy Privilege". The close proximity to the galleys may be bothersome. The tray table is in the armrest, making the armrest immovable and slightly reducing the seat width. There is no floor storage for this seat during takeoff and landing. 14 G None No Power Seat 14 G is an Economy Class Bulkhead seat that Brussels Airlines designates as "Economy Privilege". The close proximity to the galleys may be bothersome. The tray table is in the armrest, making the armrest immovable and slightly reducing the seat width. There is no floor storage for this seat during takeoff and landing. 14 H None No Power Seat 14 H is an Economy Class Bulkhead seat that Brussels Airlines designates as "Economy Privilege". The close proximity to the galleys may be bothersome. The tray table is in the armrest, making the armrest immovable and slightly reducing the seat width. There is no floor storage for this seat during takeoff and landing. 14 K None No Power Seat 14 K is an Economy Class Bulkhead seat that Brussels Airlines designates as "Economy Privilege". The close proximity to the galleys may be bothersome. The tray table is in the armrest, making the armrest immovable and slightly reducing the seat width. There is no floor storage for this seat during takeoff and landing. 15 A None No Power Seat 15 A is an Economy Class seat that Brussels Airlines designates as "Economy Privilege". 15 C None No Power Seat 15 C is an Economy Class seat that Brussels Airlines designates as "Economy Privilege". 15 D None No Power Seat 15 D is an Economy Class seat that Brussels Airlines designates as "Economy Privilege". This seat has additional legroom due to the lack of a seat in front. Some floor storage space may be restricted due to the presence of an entertainment equipment box. The tray table is in the armrest, making the armrest immovable and slightly reducing seat width. There is no floor storage for this seat during takeoff and landing. 15 E None No Power Seat 15 E is an Economy Class seat that Brussels Airlines designates as "Economy Privilege". 15 F None No Power Seat 15 F is an Economy Class seat that Brussels Airlines designates as "Economy Privilege". 15 G None No Power Seat 15 G is an Economy Class seat that Brussels Airlines designates as "Economy Privilege". This seat has additional legroom due to the lack of a seat in front. Some floor storage space may be restricted due to the presence of an entertainment equipment box. The tray table is in the armrest, making the armrest immovable and slightly reducing seat width. There is no floor storage for this seat during takeoff and landing. 15 H None No Power Seat 15 H is an Economy Class seat that Brussels Airlines designates as "Economy Privilege". 15 K None No Power Seat 15 K is an Economy Class seat that Brussels Airlines designates as "Economy Privilege". 16 A None No Power Seat 16 A is an Economy Class seat that Brussels Airlines designates as "Economy Privilege". 16 C None No Power Seat 16 C is an Economy Class seat that Brussels Airlines designates as "Economy Privilege". 16 D None No Power Seat 16 D is an Economy Class seat that Brussels Airlines designates as "Economy Privilege". This seat has restricted legroom and floor storage space due to the presence of an entertainment equipment box. 16 E None No Power Seat 16 E is an Economy Class seat that Brussels Airlines designates as "Economy Privilege". 16 F None No Power Seat 16 F is an Economy Class seat that Brussels Airlines designates as "Economy Privilege". 16 G None No Power Seat 16 G is an Economy Class seat that Brussels Airlines designates as "Economy Privilege". This seat has restricted legroom and floor storage space due to the presence of an entertainment equipment box. 16 H None No Power Seat 16 H is an Economy Class seat that Brussels Airlines designates as "Economy Privilege". 16 K None No Power Seat 16 K is an Economy Class seat that Brussels Airlines designates as "Economy Privilege". 17 A None No Power Seat 17 A is an Economy Class seat that Brussels Airlines designates as "Economy Privilege". 17 C None No Power Seat 17 C is an Economy Class seat that Brussels Airlines designates as "Economy Privilege". 17 D None No Power Seat 17 D is an Economy Class seat that Brussels Airlines designates as "Economy Privilege". This seat has restricted legroom and floor storage space due to the presence of an entertainment equipment box. 17 E None No Power Seat 17 E is an Economy Class seat that Brussels Airlines designates as "Economy Privilege". 17 F None No Power Seat 17 F is an Economy Class seat that Brussels Airlines designates as "Economy Privilege". 17 G None No Power Seat 17 G is an Economy Class seat that Brussels Airlines designates as "Economy Privilege". This seat has restricted legroom and floor storage space due to the presence of an entertainment equipment box. 17 H None No Power Seat 17 H is an Economy Class seat that Brussels Airlines designates as "Economy Privilege". 17 K None No Power Seat 17 K is an Economy Class seat that Brussels Airlines designates as "Economy Privilege". 18 A None No Power Seat 18 A is an Economy Class seat that Brussels Airlines designates as "Economy Privilege". 18 C None No Power Seat 18 C is an Economy Class seat that Brussels Airlines designates as "Economy Privilege". 18 D None No Power Seat 18 D is an Economy Class seat that Brussels Airlines designates as "Economy Privilege". This seat has restricted legroom and floor storage space due to the presence of an entertainment equipment box. 18 E None No Power Seat 18 E is an Economy Class seat that Brussels Airlines designates as "Economy Privilege". 18 F None No Power Seat 18 F is an Economy Class seat that Brussels Airlines designates as "Economy Privilege". 18 G None No Power Seat 18 G is an Economy Class seat that Brussels Airlines designates as "Economy Privilege". This seat has restricted legroom and floor storage space due to the presence of an entertainment equipment box. 18 H None No Power Seat 18 H is an Economy Class seat that Brussels Airlines designates as "Economy Privilege". 18 K None No Power Seat 18 K is an Economy Class seat that Brussels Airlines designates as "Economy Privilege". 19 A None No Power Seat 19 A is an Economy Class seat that is missing a window. 19 D None No Power Seat 19 D is an Economy Class seat that may have restricted legroom and floor storage space due to the presence of an entertainment equipment box. 19 G None No Power Seat 19 G is an Economy Class seat that may have restricted legroom and floor storage space due to the presence of an entertainment equipment box. 19 K None No Power Seat 19 K is an Economy Class seat that is missing a window. 20 D None No Power Seat 20 D is an Economy Class seat that may have restricted legroom and floor storage space due to the presence of an entertainment equipment box. 20 G None No Power Seat 20 G is an Economy Class seat that may have restricted legroom and floor storage space due to the presence of an entertainment equipment box. 21 D None No Power Seat 21 D is an Economy Class seat that may have restricted legroom and floor storage space due to the presence of an entertainment equipment box. 21 G None No Power Seat 21 G is an Economy Class seat that may have restricted legroom and floor storage space due to the presence of an entertainment equipment box. 22 D None No Power Seat 22 D is an Economy Class seat that may have restricted legroom and floor storage space due to the presence of an entertainment equipment box. 22 G None No Power Seat 22 G is an Economy Class seat that may have restricted legroom and floor storage space due to the presence of an entertainment equipment box. 23 D None No Power Seat 23 D is an Economy Class seat that may have restricted legroom and floor storage space due to the presence of an entertainment equipment box. 23 G None No Power Seat 23 G is an Economy Class seat that may have restricted legroom and floor storage space due to the presence of an entertainment equipment box. 24 D None No Power Seat 24 D is an Economy Class seat that may have restricted legroom and floor storage space due to the presence of an entertainment equipment box. 24 G None No Power Seat 24 G is an Economy Class seat that may have restricted legroom and floor storage space due to the presence of an entertainment equipment box. 25 D None No Power Seat 25 D is an Economy Class seat that may have restricted legroom and floor storage space due to the presence of an entertainment equipment box. 25 G None No Power Seat 25 G is an Economy Class seat that may have restricted legroom and floor storage space due to the presence of an entertainment equipment box. 26 D None No Power Seat 26 D is an Economy Class seat that may have restricted legroom and floor storage space due to the presence of an entertainment equipment box. 26 G None No Power Seat 26 G is an Economy Class seat that may have restricted legroom and floor storage space due to the presence of an entertainment equipment box. 27 D None No Power Seat 27 D is an Economy Class seat that may have restricted legroom and floor storage space due to the presence of an entertainment equipment box. 27 G None No Power Seat 27 G is an Economy Class seat that may have restricted legroom and floor storage space due to the presence of an entertainment equipment box. 28 D None No Power Seat 28 D is an Economy Class seat that may have restricted legroom and floor storage space due to the presence of an entertainment equipment box. 28 G None No Power Seat 28 G is an Economy Class seat that may have restricted legroom and floor storage space due to the presence of an entertainment equipment box. 29 D None No Power Seat 29 D is an Economy Class seat that may have restricted legroom and floor storage space due to the presence of an entertainment equipment box. 29 G None No Power Seat 29 G is an Economy Class seat that may have restricted legroom and floor storage space due to the presence of an entertainment equipment box. 30 A None No Power Seat 30 A is an Economy Class seat in the last row of the section that may have limited recline. The close proximity to the lavatories may be bothersome as passengers tend to congregate in this area. 30 C None No Power Seat 30 C is an Economy Class seat in the last row of the section that may have limited recline. The close proximity to the lavatories may be bothersome as passengers tend to congregate in this area. 30 H None No Power Seat 30 H is an Economy Class seat in the last row of the section that may have limited recline. The close proximity to the lavatories may be bothersome as passengers tend to congregate in this area. 30 K None No Power Seat 30 K is an Economy Class seat in the last row of the section that may have limited recline. The close proximity to the lavatories may be bothersome as passengers tend to congregate in this area. 31 D None No Power Seat 31 D is an Economy Class seat that may have limited recline. Legroom and floor storage space may be restricted due to the presence of an entertainment equipment box. The close proximity to the lavatories may be bothersome as passengers tend to congregate in this area. 31 E None No Power Seat 31 E is an Economy Class seat that may have limited recline. The close proximity to the lavatories may be bothersome as passengers tend to congregate in this area. 31 F None No Power Seat 31 F is an Economy Class seat that may have limited recline. The close proximity to the lavatories may be bothersome as passengers tend to congregate in this area. 31 G None No Power Seat 31 G is an Economy Class seat that may have limited recline. Legroom and floor storage space may be restricted due to the presence of an entertainment equipment box. The close proximity to the lavatories may be bothersome as passengers tend to congregate in this area. 32 A None No Power Seat 32 A is an Economy Class Exit Row seat with extra legroom. The tray table is in the armrest, making the armrest immovable and slightly reducing seat width. There is no floor storage for this seat during take-off or landing. 32 C None No Power Seat 32 C is an Economy Class Exit Row seat with extra legroom. The tray table is in the armrest, making the armrest immovable and slightly reducing seat width. There is no floor storage for this seat during take-off or landing. 32 D None No Power Seat 32 D is an Economy Class Exit Row seat with extra legroom. However, floor space may be restricted due to the presence of an entertainment equipment box. The pitch for this seat is 42.0". The tray table is in the armrest, making the armrest immovable and slightly reducing seat width. There is no floor storage for this seat during take-off or landing. The close proximity to the lavatories may be bothersome. 32 E None No Power Seat 32 E is an Economy Class Exit Row seat with extra legroom. However, floor space may be restricted due to the presence of an entertainment equipment box. The pitch for this seat is 42.0". The tray table is in the armrest, making the armrest immovable and slightly reducing seat width. There is no floor storage for this seat during take-off or landing. The close proximity to the lavatories may be bothersome. 32 F None No Power Seat 32 F is an Economy Class Exit Row seat with extra legroom. However, floor space may be restricted due to the presence of an entertainment equipment box. The pitch for this seat is 42.0". The tray table is in the armrest, making the armrest immovable and slightly reducing seat width. There is no floor storage for this seat during take-off or landing. The close proximity to the lavatories may be bothersome. 32 G None No Power Seat 32 G is an Economy Class Exit Row seat with extra legroom. However, floor space may be restricted due to the presence of an entertainment equipment box. The pitch for this seat is 42.0". The tray table is in the armrest, making the armrest immovable and slightly reducing seat width. There is no floor storage for this seat during take-off or landing. The close proximity to the lavatories may be bothersome. 32 H None No Power Seat 32 H is an Economy Class Exit Row seat with extra legroom. The tray table is in the armrest, making the armrest immovable and slightly reducing seat width. There is no floor storage for this seat during take-off or landing. 32 K None No Power Seat 32 K is an Economy Class Exit Row seat with extra legroom. The tray table is in the armrest, making the armrest immovable and slightly reducing seat width. There is no floor storage for this seat during take-off or landing. 33 D None No Power Seat 33 D is an Economy Class seat that may have restricted legroom and floor storage space due to the presence of an entertainment equipment box. 33 G None No Power Seat 33 G is an Economy Class seat that may have restricted legroom and floor storage space due to the presence of an entertainment equipment box. 34 D None No Power Seat 34 D is an Economy Class seat that may have restricted legroom and floor storage space due to the presence of an entertainment equipment box. 34 G None No Power Seat 34 G is an Economy Class seat that may have restricted legroom and floor storage space due to the presence of an entertainment equipment box. 35 D None No Power Seat 35 D is an Economy Class seat that may have restricted legroom and floor storage space due to the presence of an entertainment equipment box. 35 G None No Power Seat 35 G is an Economy Class seat that may have restricted legroom and floor storage space due to the presence of an entertainment equipment box. 36 D None No Power Seat 36 D is an Economy Class seat that may have restricted legroom and floor storage space due to the presence of an entertainment equipment box. 36 G None No Power Seat 36 G is an Economy Class seat that may have restricted legroom and floor storage space due to the presence of an entertainment equipment box. 37 D None No Power Seat 37 D is an Economy Class seat that may have restricted legroom and floor storage space due to the presence of an entertainment equipment box. 37 G None No Power Seat 37 G is an Economy Class seat that may have restricted legroom and floor storage space due to the presence of an entertainment equipment box. 38 D None No Power Seat 38 D is an Economy Class seat that may have restricted legroom and floor storage space due to the presence of an entertainment equipment box. 38 G None No Power Seat 38 G is an Economy Class seat that may have restricted legroom and floor storage space due to the presence of an entertainment equipment box. 39 D None No Power Seat 39 D is an Economy Class seat that may have restricted legroom and floor storage space due to the presence of an entertainment equipment box. 39 G None No Power Seat 39 G is an Economy Class seat that may have restricted legroom and floor storage space due to the presence of an entertainment equipment box. 40 A None No Power Seat 40 A is an Economy Class seat that can feel cramped due to the curvature of the fuselage. 40 C None No Power Seat 40 C is an Economy Class seat that can feel cramped due to the curvature of the fuselage. 40 D None No Power Seat 40 D is an Economy Class seat that may have restricted legroom and floor storage space due to the presence of an entertainment equipment box. 40 G None No Power Seat 40 G is an Economy Class seat that may have restricted legroom and floor storage space due to the presence of an entertainment equipment box. 40 H None No Power Seat 40 H is an Economy Class seat that can feel cramped due to the curvature of the fuselage. 40 K None No Power Seat 40 K is an Economy Class seat that can feel cramped due to the curvature of the fuselage. 41 A None No Power Seat 41 A is an Economy Class seat that can feel cramped due to the curvature of the fuselage. 41 C None No Power Seat 41 C is an Economy Class seat that can feel cramped due to the curvature of the fuselage. 41 D None No Power Seat 41 D is an Economy Class seat that may have restricted legroom and floor storage space due to the presence of an entertainment equipment box. 41 G None No Power Seat 41 G is an Economy Class seat that may have restricted legroom and floor storage space due to the presence of an entertainment equipment box. 41 H None No Power Seat 41 H is an Economy Class seat that can feel cramped due to the curvature of the fuselage. 41 K None No Power Seat 41 K is an Economy Class seat that can feel cramped due to the curvature of the fuselage. 42 A None No Power Seat 42 A is an Economy Class seat that can feel cramped due to the curvature of the fuselage. 42 C None No Power Seat 42 C is an Economy Class seat that can feel cramped due to the curvature of the fuselage. 42 D None No Power Seat 42 D is an Economy Class seat may be bumped by service carts or others passing by due to the awkward configuration transition from 4 to 3 seats. Legroom and floor storage space may be restricted due to the presence of an entertainment equipment box. 42 G None No Power Seat 42 G is an Economy Class seat may be bumped by service carts or others passing by due to the awkward configuration transition from 4 to 3 seats. Legroom and floor storage space may be restricted due to the presence of an entertainment equipment box. 42 H None No Power Seat 42 H is an Economy Class seat that can feel cramped due to the curvature of the fuselage. 42 K None No Power Seat 42 K is an Economy Class seat that can feel cramped due to the curvature of the fuselage. 43 D None No Power Seat 43 D is an Economy Class seat where legroom may be restricted due to the awkward configuration transition from 4 to 3 seats. It can be uncomfortable to maneuver your feet around the extra seat anchors and it may be difficult to see the TV screens. Legroom and floor storage space may be restricted due to the presence of an entertainment equipment box. The Tray Table is in the armrest, making the armrest immovable and slightly reducing seat width. 43 F None No Power Seat 43 F is an Economy Class seat where legroom may be restricted due to the awkward configuration transition from 4 to 3 seats. While you will have extra floor storage, it can be uncomfortable to maneuver your feet around the extra seat anchors and it may be difficult to see the TV screens. The tray table is in the armrest, making the armrest immovable and slightly reducing seat width. 43 G None No Power Seat 43 G is an Economy Class seat where legroom may be restricted due to the awkward configuration transition from 4 to 3 seats. It can be uncomfortable to maneuver your feet around the extra seat anchors and it may be difficult to see the TV screens. Legroom and floor storage space may be restricted due to the presence of an entertainment equipment box. The Tray Table is in the armrest, making the armrest immovable and slightly reducing seat width. 44 D None No Power Seat 44 D is an Economy Class seat that may have restricted legroom and floor storage space due to the presence of an entertainment equipment box. 44 G None No Power Seat 44 G is an Economy Class seat that may have restricted legroom and floor storage space due to the presence of an entertainment equipment box. 45 D None No Power Seat 45 D is an Economy Class seat that may have restricted legroom and floor storage space due to the presence of an entertainment equipment box. 45 G None No Power Seat 45 G is an Economy Class seat that may have restricted legroom and floor storage space due to the presence of an entertainment equipment box. 46 A None No Power Seat 46 A is an Economy Class seat in the last row of the plane that may not recline. The close proximity to the lavatory might be bothersome. 46 C None No Power Seat 46 C is an Economy Class seat in the last row of the plane that may not recline. The close proximity to the lavatory might be bothersome. 46 D None No Power Seat 46 D is an Economy Class seat that may have restricted legroom and floor storage space due to the presence of an entertainment equipment box. The close proximity to the lavatory and galleys may be bothersome. 46 G None No Power Seat 46 G is an Economy Class seat that may have restricted legroom and floor storage space due to the presence of an entertainment equipment box. The close proximity to the lavatory and galleys may be bothersome. 46 H None No Power Seat 46 H is an Economy Class seat in the last row of the plane that may not recline. 46 K None No Power Seat 46 K is an Economy Class seat in the last row of the plane that may not recline. 47 D None No Power Seat 47 D is an Economy Class seat in the last row of the plane that may not recline. Legroom and floor storage space may be restricted due to the presence of an entertainment equipment box. The close proximity to the lavatory and galleys may be bothersome. 47 F None No Power Seat 47 F is an Economy Class seat that may not recline. The close proximity to the lavatory and galleys may be bothersome. 47 G None No Power Seat 47 G is an Economy Class seat in the last row of the plane that may not recline. Legroom and floor storage space may be restricted due to the presence of an entertainment equipment box. The close proximity to the lavatory and galleys may be bothersome. 7 D None No Power Seat 7 D is a Business Class seat whose close proximity to the galleys may be bothersome. 7 F None No Power Seat 7 F is a Business Class seat whose close proximity to the galleys may be bothersome. 7 K None No Power Seat 7 K is a Business Class seat whose close proximity to the galleys may be bothersome. This aircraft offers a variety of audio channels such as Classical music and Pop music. Audio options are listed in Brussels Airlines' magazine, b.spirit. USB power outlets in Business class allow passengers to play their own media as well. Each seat has a personal television with many viewing options including movies and television shows. Video options are listed in Brussels Airlines' magazine, b.spirit. USB power outlets in Business class allow passengers to play their own media on their individual screens as well. 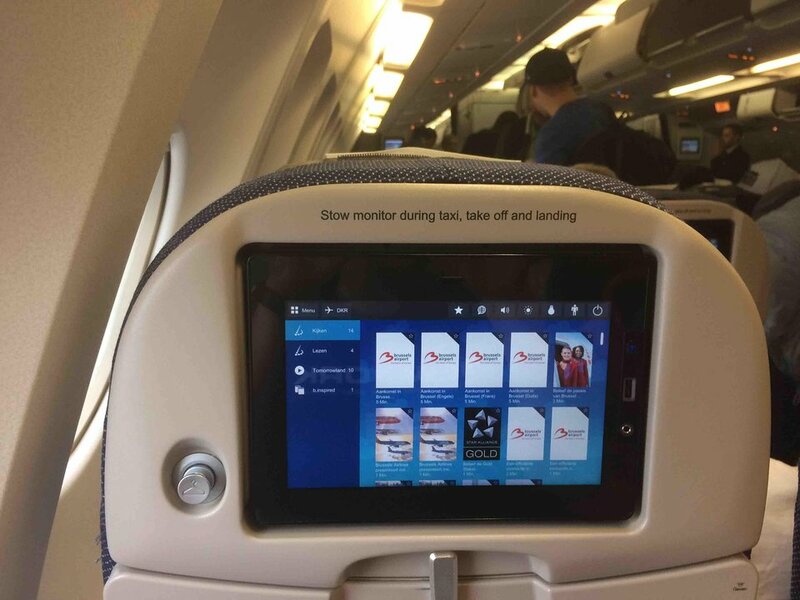 Business Class seats include a 15.3" personal TV screen, and Economy Class seats include an 8.9" TV screen. There are individual laptop AC power outlets in Business Class. Both classses feature USB ports. In Business Class and b.flex Economy, complementary meal and beverages are served. Business class is also welcomed with a glass of champagne. On long-haul flights, Economy class is also served complementary food and beverages. A variety of food and beverages are always available for purchase. This Airbus A330-300 accommodates 288 passengers in a two-class configuration, with 30 flat bed seats in Business Class and 258 standard seats in Economy Class. This aircraft is used on long haul flights to Africa and the U.S. (New York). The entire Brussels long-haul fleet has been re-designed with an entirely new Business Class cabin featuring longer, more comfortable flat bed seats with adjustable cushions. All classes have been equipped with new in-flight entertainment systems featuring hundreds of hours of movies and touch screen features. The economy cabin includes more comfortable seats with more legroom and increased seat recline. Very Unconfortable seat in this plane Very hard in the back. Probably the seat is too old It is like they had removed the foam from the seat. It is unbelievable for a business class seat Anyway all equipment in this plane should be renovated because they are completely outdated. BE AWARE! 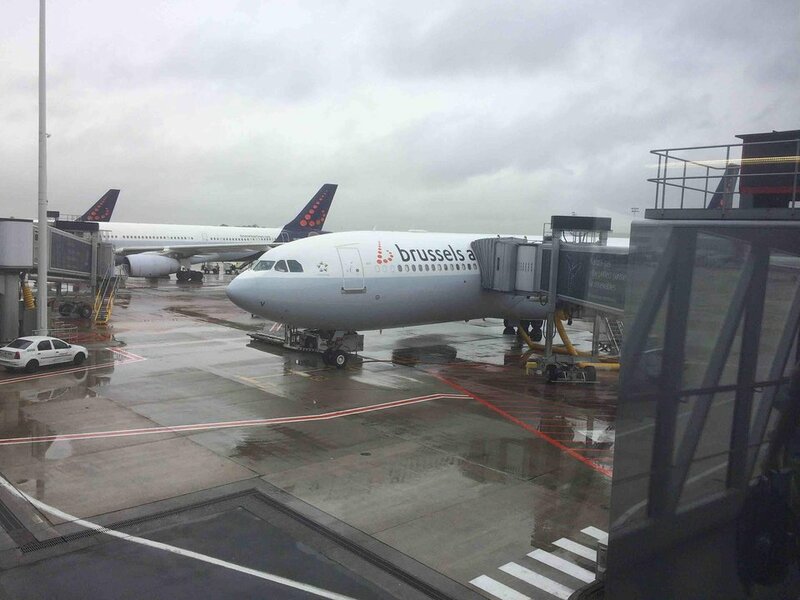 Bruxelles airlines have changed out one plane for an old Singapore Airlines configuration. Business class is crappy, 6 seats across, only angled lie-flat seats. We asked the crew, because we didn't get the seats we had booked, and we were unhappy with the poorer seats. They said it was one aircraft they had bought from Singapore airlines, and which had not been updated to the new seats. Seat pitch is large, as advertised. Otherwise, older and more worn down interior than equivalent EU carriers on this route to JFK. IFE was good quality but had minimal content, particularly for English speakers. No blanket for daytime; got quite cold. Power is available via USB outlet located next to the screen of the infotainment center. Probably the most responsive entertainment system of any of the major airlins. This was a very comfy seat and proximity to the galley was no issue at all. My flight was on 20th of August. 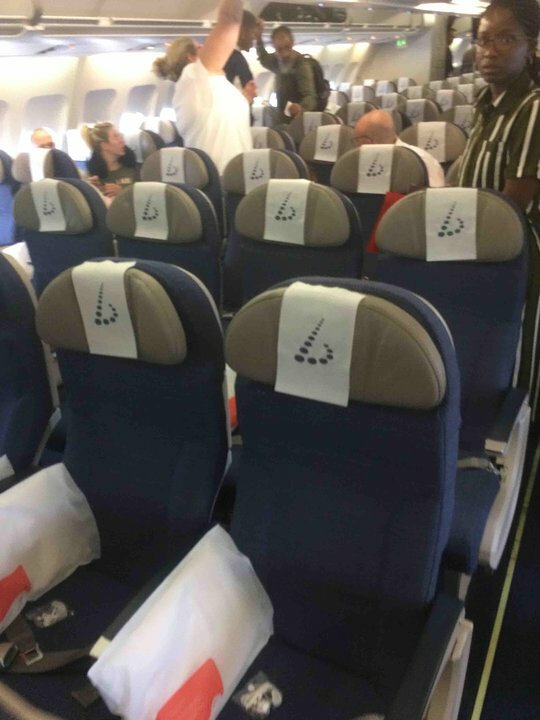 Seat 16K is now a so-called Economy - Privilege seat at the additionnal cost. In fact the seat is worse than an 'ordinary' econmy seat. The pitch is supposed to be double that of an ordinary economy seat but if the seat before you reclines there is only about 30 cm left on eye level: impossible to see the video screen as these do not tilt and impossible to work on ones laptop. The width of the privilege seat has remained the same. And the promised privilege treatment (champain, chocolates) was forgotten on this particular flight. In short: no value for the additional cost incurred. The worst econ seat I have ever experiencd out of the over 30 carries I have flown with. No padding and horizontial bars running mid and lower back. I checked other seats and they were the same. Legroom decent/above average. But the seat is simply unacceptible for long haul. 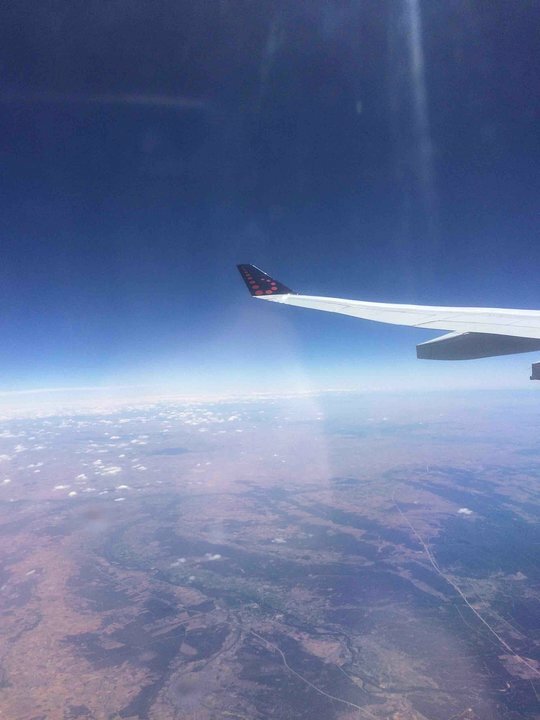 Flew this on 22October2015. Got upgraded at Gate, since flight was full and some SN staff were on standby. The seat was once again great (I have flown this aircraft many times). In flight video and audio is ridiculously limited compared to other airlines (LH, Swiss, Singapore airlines). Food was excellent, attendants were forgetful and the purser was simply "unfriendly" (had a bad day or was due for retirement possibly) which leads me to believe that this is ruining the reputation of the airline. Very quick disembarking in JFK. Just before landing we (all business class passengers) got a box of delicious Belgian chcolates to take with us. A nice touch ! Traveled on April 21 from JFK to BRU, upgraded for 1000 USD at the check in, very good lounge at JFK, boarding was smooth, good seating, limited IFE compared to LH and the screen does not tilt so the sun was reflecting in the shiny TV screen, excellent food and drinks as well as the service, we slept very well. Very generous legroom for a coach seat. One of the best sleeping position I have experienced in business class. If you are travelling alone, single seats like the 3A offer you a lot of space on the side. For some reason, people (including flight attendants) feel it is quite ok to climb over you and the other occupants of row 32 as a cut through between aisles. I know that for them, it might not seem like a big deal but when you're sitting in that row and literally have dozens of people climb over you throughout the flight, it makes it difficult to settle in, let alone sleep. Beware of this seat. JFK - BRU Economy seats were the best we've ever had. Lots of legroom and good recline. Seats were very firm with good support. I'm 6 feet & 230 lbs. Entertainment excellent. 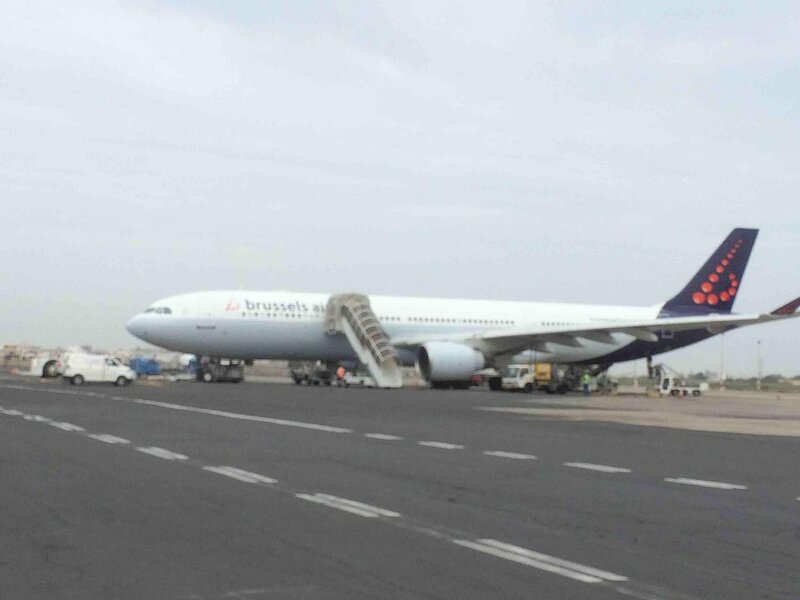 Brussels Airlines flies 1 versions of Airbus A330-300.